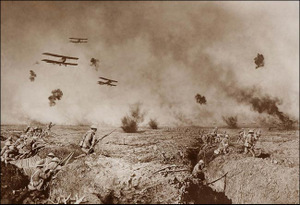 Usage notes: World War I was originally called The World War or The Great War because it was believed to have been the war to end all wars—right up until WWII began approaching. In French, this belief was immortalized in the expression la der des der, a double apocope of la dernière (guerre) des dernières (guerres), meaning "the war to end all wars." Mon grand-père a été tué pendant la der des der. My grandfather was killed in World War I. 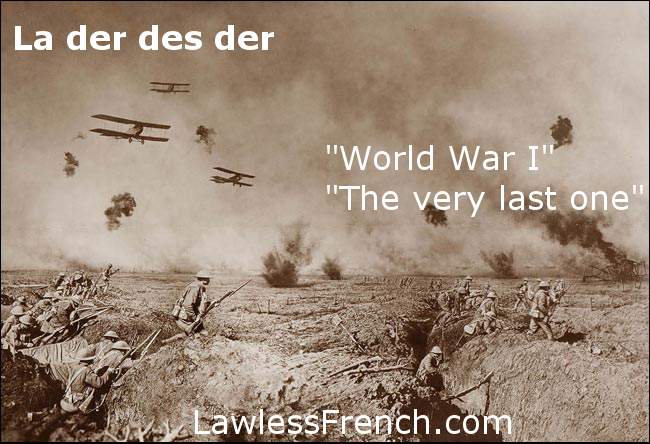 By extension, der des der refers to the last or the latest of something. Je prendrai encore un verre de vin, mais c’est le der des der. I’ll take another glass of wine, but that’s the very last one. J’adore cette robe, c’est la der des der ! I love this dress, it’s the very latest fashion! Note that the article changes to agree with the gender of the noun.